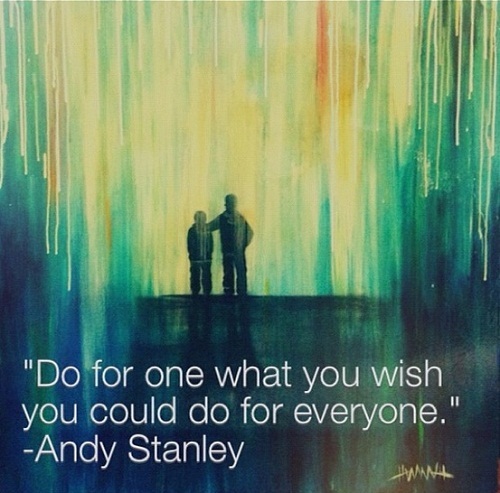 This quote is famously known and repeated widely from Andy Stanley. Its also a quote my long time pastor Simon at my church, repeated to us often from Mark 1:34-45 if you ever check out the bible. It is a philosophy taught to me by mother, and her mother before her, that I have lived by all of my life. We all often see the senseless injustice, inequality, poverty and much more affecting us, those we know and love, strangers and and the world at large. A story, a video, an image, a news clip, your heart gets tugged, you feel moved to do something. Then suddenly, taking your anger and wanting to make a difference, you start to feel anxious about the enormity of the problem, "It's too much", "will my contribution really make a difference?" "I can't help everyone". For many of us, life is already too full, and perhaps not as easy in many ways, no matter our different varying levels of privilege. We can never change everything or make it better for everyone, we however, absolutely can radically impact one person. Here's how I see it. If 5 or 20 of us positively impacted just one other person, that would mean 40 of us get impacted (yes, when you impact someone positively, you too will get impacted from that act). If those 20 then went on to make a difference for one other person each, suddenly the number grows to 60 & 80, on and on and on it goes. The multiplication of impacting a single person can then grow to 100s, 1000s and perhaps millions, maybe more. Suddenly the impact of one you thought might not be enough, becomes much bigger than you could ever have dreamt of. Begin at home. Charity always begins at home; in your family, community, exactly where you are. Could be your neighbour, a local charity, family, elderly, kids and youths, food bank, needed voice. Go long rather than short term. Give your time. Money makes a difference, that's true, it is also the easier convenient thing to give. Your presence however, makes the most memorable impact. Give the gift of your time, your ear, your touch. Go deep rather than wide. Partner with local people in your community that are already supporting charities and causes, in and outside of your community. Especially if you aren't able give time, give money directly. Give to groups that are transparent, if at all possible, that keep you up-to-date on the impact your contribution has had to the charities, causes, communities they support and champion. Some of us may not be able to give time and/or money to a cause, that's understandable. In your day to day life, I would recommend making choices that make an outside impact. Buy local produce for your food, it will impact your local farmers and help make a difference for the environment, it is also generally healthier. Consistently shop with an eye and awareness to ethical products that are fairly traded. There are many stores locally, as well as online that have just about everything we could ever need that has been made by hand, using recycled/upcycled or ethically sourced materials and are fairly traded. When you shop this way, you're giving the gift of opportunity to many disadvantaged communities and artisans. Causes We Support. All donations go directly to the specific charities. Street Life is designed to engage street-involved youth in the Commercial Drive area of East Vancouver in meaningful relationships to help them move towards a safe, healthy and holistic well being. We use a converted RV as a mobile drop-in youth center where the focus is on building relationships, reputations and referrals. SASANE is a survivor-led organization established in 2008 under the founding principle that women survivors of human trafficking have immense potential to combat the exploitation of Nepalese women and girls, and to create social change. Since the organization's founding in Kathmandu and expansion to Pokhara and seven village areas, four key and interrelated programs (Paralegal, SOS, School Awareness & Community Outreach) have been created through an innovative strategy which combines paralegal training, small business development, school awareness, and community outreach. These interdependent programs assume a rights-based approach to break the cycles of exploitation and victimization, increase women's access to justice, and reintegrate survivors into society as valued and respected members of their community. 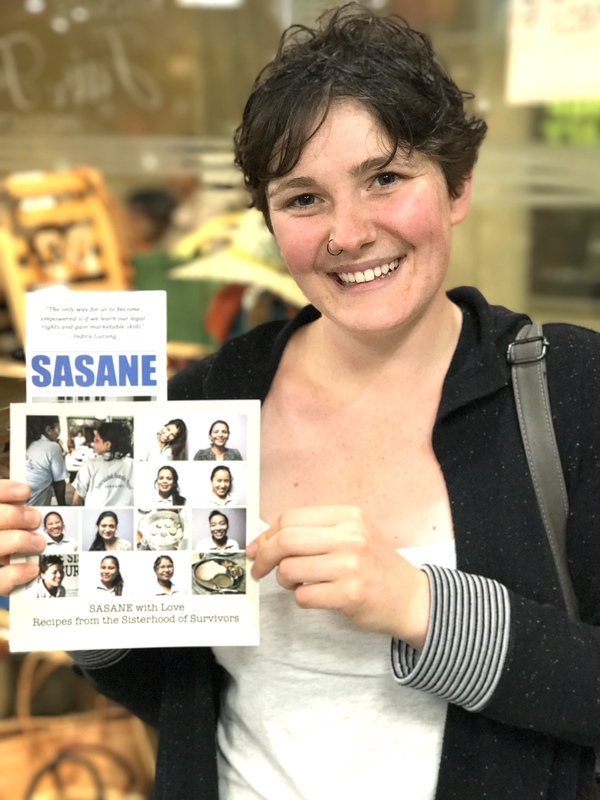 Buy a SASANE Recipe book. $20. Kipepeo Designs exists to transform the lives of women in Kibera through holistic and comprehensive programmes. Kipepeo products are exquisitely handcrafted by the women working at the Kipepeo project in Kibera, one of the world's toughest slums. These women are either orphans or single parents in a woman led home. Recycled from office waste paper, each of our unique cards has been signed on the back by its maker. By earning a regular salary, the women can provide a better standard of living for themselves and their families in terms of food, accommodation, education for children and even saving a little. But it’s not all about money. The women reap other benefits from working at the project including valuable skills, raised self-esteem, plus the companionship and support from working with friends. Make a difference - buy cards that change lives!